Cold weather, colds and flu often remind me of cooking chicken soup. For some reason, chicken soup recipe is well-suited for these conditions. In line with the weather, these cold December days have got me into cooking chicken soup at home. I don't like creams in soups so I made chicken soup that is not cream-based. This simple home cooking recipe is low calorie compared to the chicken soup with creams that we are so familiar with. 1. Boil the chicken in a small pot. In cooking chicken soup, you may use any part of the chicken. In my case, only had chicken wings and drumsticks in the fridge so that's what I used. De-bone the chicken when cooked. 2. Put in the onions, ginger and garlic into the broth. 3. Season with fish sauce and pepper. Cooking chicken soup recipe is very easy to do. This home-made recipe has no preservatives (other than the natural ones) and no msg-added too. 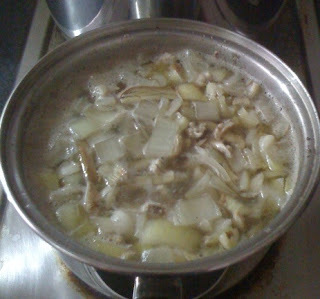 You may also add some carrot bits and fresh onion rings in cooking chicken soup, depending on your preference. 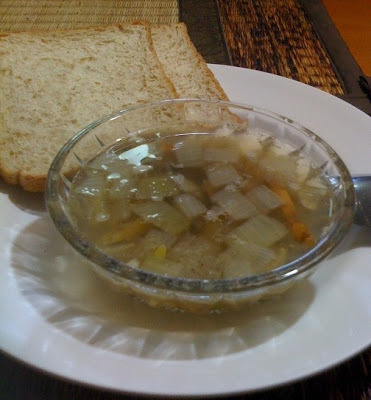 This home cooking recipe is good for flu, thanks to the onions and the garlic. It also eases clogged nose with the help of ginger. Chicken is nonetheless the healthy option among the proteins. Aside from being the healthy option, cooking chicken soup this way eliminates the calories of creams and cheeses. I hope you enjoy cooking chicken soup at home. Here's another chicken recipe which you might enjoy - Pasta with chicken and basil. hmmm!! im gonna try this one too!! yum yum!